Last 4 Children Detained On Nauru Are Heading To The U.S. The transfer is part of a deal between Australia and the U.S., under the Obama administration, in which the U.S. agreed to accept some 1,250 refugees. President Trump has called it a "dumb deal." Last 4 Children Detained On Nauru Are Heading To The U.S. Concerns have escalated about the deteriorating health of asylum-seekers on Nauru, such as these individuals pictured last September. Australia says the last four asylum-seeking children held in its detention centers on the island nation of Nauru are to be transferred to the United States. The country has faced years of criticism from human rights advocates over the health of asylum-seekers and the condition of detention facilities on the island. Amnesty International and other groups have described a mental health crisis where self-harm is common. The tiny island nation is just 8 square miles and has only 10,000 citizens. The transfer is part of a deal between Australia and the U.S., under the Obama administration, in which the U.S. agreed to accept some 1,250 refugees. Less than a month after President Trump took office, he blasted the agreement as a "dumb deal" — nevertheless, refugees started to be transferred to the U.S. in September 2017. "Refugees from Nauru and Papua New Guinea continue to arrive in the United States," a State Department spokesperson told NPR. "Nearly 500 refugees from these locations have been resettled to date. These refugees have been subject to the same stringent vetting procedures as other refugees from around the world." The spokesperson did not provide specific information about Australia's statement that these four children are scheduled for transfer. The Australian government implemented a stricter border policy in 2013, the centerpiece of which is "No-one who travels illegally to Australia by boat will be allowed to remain in Australia." After that, Australian authorities routinely began to intercept asylum-seekers and bring them to detention facilities on Nauru or to a detention center on Manus Island in Papua New Guinea, where single men are held. They would then be detained there indefinitely. "With the last four children booked to leave for the US, every asylum seeker child will now be off Nauru," Australian Prime Minister Scott Morrison said on Twitter. "Our strong border protection policies have enabled us to secure our borders, stop the boats and the tragic drownings at sea while getting children out of detention and off Nauru without putting our stronger borders at risk. We have got the balance right." Morrison, leader of Australia's Liberal Party, became prime minister last August. He said in a statement that there were 109 asylum-seeker children on the island when he took office and that his government has been working "quietly and methodically through this process." 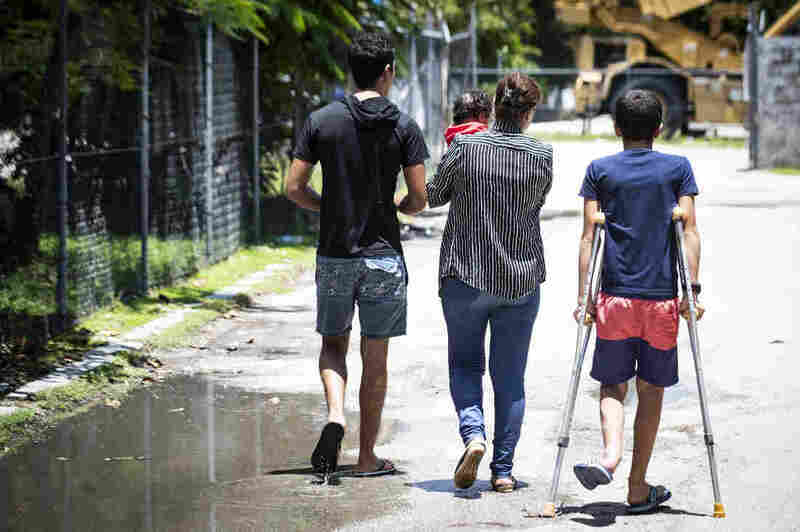 Local advocates from the Asylum Seeker Resource Centre also said that "all of the critically sick children detained by the Australian government on Nauru were now receiving the medical care they need in Australia." They say it has been a long road. "In public the Government will call this a win and boast about evacuating this last child for urgent medical care but behind the scenes we have had to fight in the courts or threaten legal action to evacuate every single one of these sick children and their families," David Burke, senior lawyer with the Human Rights Law Centre, said in a statement. The ASRC said in August that nearly 30 percent of the remaining children were suffering from symptoms of "Traumatic Withdrawal Syndrome." "It is most commonly seen in children and young adolescents, and has the clinical features dramatic social withdrawal, with severe reduction or inability to walk, talk, eat, and drink, self-care or socialise," it said. It added: "These children cannot recover on Nauru because ... Nauru is the cause of their trauma." While there will soon be no more children in the centers, Reuters reports that an estimated 1,000 people remain held. In a previous version of this story, we dropped the word "illegally" from the quote regarding Australia's border policy for people arriving by boat. The actual quote is "No-one who travels illegally to Australia by boat will be allowed to remain in Australia."